Driving down the Pacific Coast Highway was going to be one of our longest days on the road, but a drive I had been looking forward to for a long time. Before we set off we took a stroll along the beach into Monterey and had breakfast on the wharf – a massive breakfast burrito set me up for the day perfectly. The first indication of just how good this road would be was the sign warning of “Hills and curves for next 75 miles” – my idea of heaven! 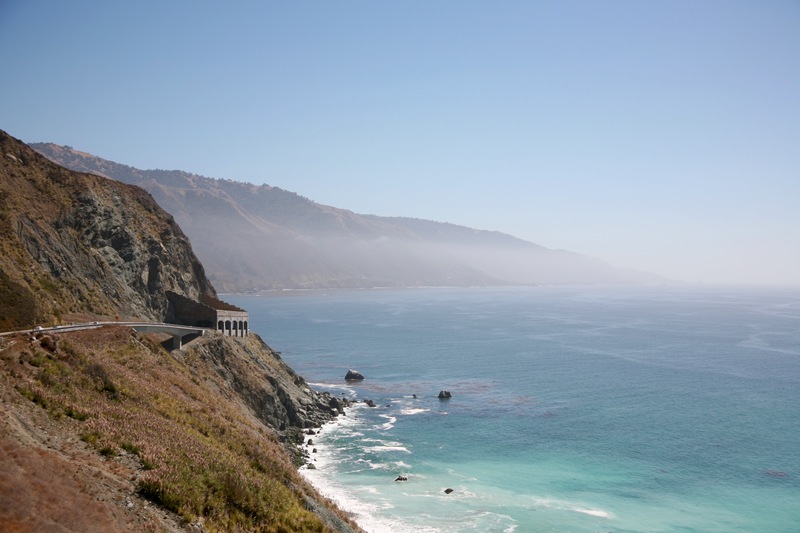 The first part of the Pacific Coast Highway is through Big Sur, around each of the many corners there was new new vista, with mountains running into the Pacific as far as the eye can see – photos really don’t do it justice. Fortunately there were plenty of areas to stop and enjoy the view, which we did frequently – at one stop we were able to watch a whale surfacing and jumping out of the water. Nearer to Hearst Castle there was also a colony of elephant seals just sunbathing on the beach. About halfway between Monterey and our first main stop at Hearst Castle Jen swapped into the driving seat, for what turned out to be the best section of road, lots of hairpins and camber changes etc. I’d love to experience an early morning blast down this road in a sports car, but as it was quite busy our Challenger was perfect for cruising along in. Hearst Castle was really interesting, a castle built as a private house almost 100 years ago, on a hilltop overlooking the Pacific Ocean and filled with centuries old European art. The art was also architectural, with some pieces such as the ceiling in the billiard room predating Christopher Columbus setting sail to discover what we now know as America! We spent a bit longer than planned at Hearst Castle and had a lot of distance still to cover, luckily after San Luis Obispo it was mainly freeway to Santa Barbara so I was able to stretch the Challenger a bit and we made it just as darkness was falling. Our motel is only a few minutes walk from the harbour, so we went for another seafood dinner – both of us choosing fish we’d seen at the aquarium in Monterey the previous day. Driving down the Pacific Coast Highway in a muscle car with Jen next to me is one of those memories that will stay with me forever – if you like driving, wildlife or even just nice scenery you will love it.